London - Harrison Dillard is back in London. Dillard, the oldest living 100m Olympic champion, returned to the British capital for the games, only this time not as a lanky kid from Cleveland who came out of nowhere to win the gold in 1948. 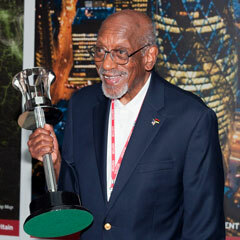 Britain's Foreign Office honoured the 89-year-old American in London on Wednesday and allowed Dillard to hold the 1948 Olympic torch again. Dillard botched the hurdles in 1948 but came back to win in the dash.